Home India-Subcontinent EAM Sushma Swaraj arrives in Durban today. EAM Sushma Swaraj arrives in Durban today. External Affairs Minister Sushma Swaraj, who is on a five-day visit to South Africa, arrived in Durban today. 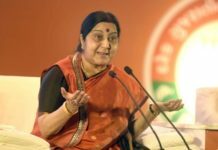 On Sunday, Swaraj reached Johannesburg and met with the South African President Cyril Ramaphosa to discuss ways of strengthening bilateral ties between India and South Africa. On Monday, she highlighted the importance of Brazil, Russia, India, China and South Africa (BRICS) association in shaping the global political, economic, and security spheres, as she welcomed her South African counterpart Lindiwe Sisulu. Today, she held a bilateral meeting with her South African counterpart and said, the informal summit has given a good opportunity to all the leaders to have in-depth one on one exchanges on bilateral issues and topics related to global importance. Tomorrow, Mrs. Swaraj is scheduled to visit the Phoenix Settlement, a South African Heritage site, a place where Mahatma Gandhi developed his philosophy of non-violence. Previous articleKarnataka CM HD Kumaraswamy to expand his Cabinet today; Over 20 ministers likely to take oath. Next articleGovt forms 3 key panels for museum of Prime Ministers Project.